What’s the Best & Worst Salad Topping for Your Heart? 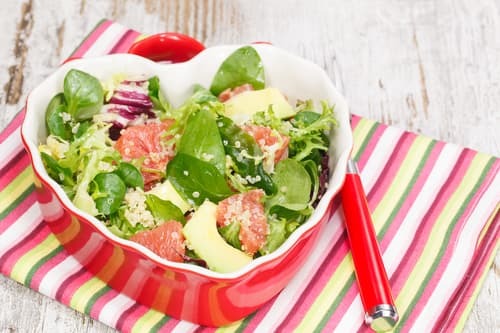 Canada Pharmacy Online > Blog > What’s the Best & Worst Salad Topping for Your Heart? Did you know the World Heart Federation commemorates September 29th World Heart Day? It’s the world’s biggest platform in the world meant to bring awareness and action about the devastating effects of cardiovascular disease (CVD). While we may have celebrated this day of awareness last week, digging into the topic never gets old. Cardiovascular Disease is the number one cause of death worldwide, with over 17 million deaths a year. Low and middle-income countries are most affected by CVD deaths, with a whopping 80%. Part of the problem is both the lack of healthy food options, and lack of healthy food knowledge. The good news is, there are plenty of ways to protect your heart. From diet and exercise, to the new drug Entresto added to heart failure guidelines. Of course, the best way forward is to avoid CVD altogether by making better food choices. Most people, the world over, aren’t getting the recommended servings of fruits and vegetables needed for healthy bodies. One of the easiest, and most affordable ways to keep your heart (and whole body) healthy is by incorporating salads. Granted, they can get a little boring after a while. This is why we’ve come up with some of the best ways to dress up your salads—specifically to protect your ticker. •	Herbs – Rosemary, thyme, sage, and oregano add plenty of flavor to your salad. Try using them in place of salts or unhealthy fats for a delicious new salad. •	Swiss Chard – This dark, leafy green is packed with potassium and magnesium, two minerals that help control blood pressure. It’s also full of fiber, vitamin A, and antioxidants lutein and zeaxanthin. This yummy green is a great salad addition when served as a bed for fish, such as salmon or tuna. Try it sautéed with a little olive oil until wilted for added flavor. •	Spinach – Nutrient dense spinach is full of lutein, folate, potassium, and fiber. Adding these into your mixed salad, or eating them as your main green is a great way to keep your heart healthy. •	almon – Rather than adding chicken to your next salad, why not salmon? Full of omega-3’s, this red fish may lessen the risk of heart rhythm disorders, and even lower blood pressure. The American Heart Association recommends two servings of salmon, or other oily fish per week. Try grilling it as a tasty fillet for the top of your salad. Side note: stick to wild caught salmon and skip the farmed. •	Tuna – Albacore tuna (white tuna) has more omega-3’s than any other variety. Trying adding grilled tuna, or even packed tuna (in water, not oil) for a protein packed boost full of heart-friendly nutrients. •	Tofu – A terrific form of vegetarian soy protein, tofu is full of heart-healthy minerals, fiber, and polyunsaturated fats. It takes on the flavors of what it’s cooked with, so it’s easily disguised by grilling or sautéing with other flavors such as garlic, and herbs. •	Black beans – Full of folate, magnesium, antioxidants, black beans help keep both cholesterol and blood sugar in check. Rinse canned beans before topping up your salad. They can also be sautéed and served warm on top. •	Walnuts – Not only can these nutrient-rich nuts lower your cholesterol, they can even protect your arteries. Packed with omega-3’s, good fats, and plenty of fiber, they add a terrific crunch to your next salad. •	Almonds – Almonds are full of plant sterols, heart-healthy fats, and fiber. All of which lead to a healthier you. They may even lower LDL (bad) cholesterol levels when consumed as part of a healthy diet. Add slivered, toasted almonds to make the perfect salad topping. Watch out for added ingredients, though! Some can have processed chemicals and added salts and sugars—big heart health no-no’s. Instead, buy unsalted slivered almonds and toast them yourself for the best effect. •	Oranges – With multiple ways of protecting your heart, oranges are more than just delicious. They have fiber pectin to fight cholesterol levels and potassium to control blood pressure and boost blood vessel health. They’re also full of flavonoid that can reduce artery inflammation. Add it to salads or make a sweet and tangy salad dressing with this sweet and juicy fruit. •	Cherries – No matter which way you like to eat your cherries you like; sweet, sour, dried—they all make good toppings for your salad. Packed with antioxidants called anthocyanins, they’re able to protect blood vessels. •	Blueberries – Add these power-punch berries to your next salad and find yourself consuming tons of those blood-vessel protecting antioxidants, anthocyanins. They’re also full of fiber and nutrients that keep you healthy. Sprinkle them on top for a little bit of sweetness to your salad. •	Apples – Apples of any color are great for your heart. The skins are full of polyphenols, which shield your body from free-radicals. They also contain pectin and fiber—both of which keep your cholesterol in check. Chop them up and sprinkle on top, or simply have a few slices on the side. •	Edamame – This one doubles as veggie and protein, since it’s the delicious protein known better as soybeans. Full of fiber, edamame can have as much as 8 grams per serving. Pop the tasty beans from their pod and sprinkle them on top of your next salad. •	Avocado – Add a quarter avocado to your salads to incorporate some fantastic heart-healthy fats. Teeming with monounsaturated fats, they’ll help lower your LDL (bad) and raise HDL (good) cholesterol. •	Broccoli – Low in cholesterol, full of antioxidants, not to mention fiber—broccoli is a super addition to your next salad. Best served lightly steamed, add it to your next salad for a slightly warmed heart-saving sensation. •	Cauliflower – Not unlike broccoli, cauliflower has been shown to protect the heart and reduce cholesterol. Bursting with antioxidants, fiber, and allicin, you’ll be hard pressed to find a better veggie addition to your greens. •	Peas – Loaded with fiber and sweet to eat, peas make a great topping for your crunchy lunch. They’re also low in calories, but high in micronutrients, fiber, and even protein. •	Jicama – High in vitamin C and other minerals, jicama helps with your body’s anti-inflammatory response. They’re also low in calories, and sodium, but high in fiber and iron. Chop them up into small squares or thin strips for a nutty-flavored crunch. •	Beets – A powerhouse of nutrients, beets add a uniquely earthy flavor to your salad. Packed full of phytonutrients that can ward off cancer and naturally occurring nitrates, which converts to nitric oxide to improve blood flow and lower blood pressure—beets make a sweet salad cohort. •	Sweet Potato – Who would think to add a little sweet potato to a salad? Low on the glycemic index and full of fiber, vitamin A, and lycopene, sweet potatoes will lower your blood sugar levels. Bake or roast them first, then cut into delectable cubes before tossing these sweet veggies into your next salad. •	Olive Oil – Full of antioxidants, olive oil can protect your blood vessels and even lower cholesterol levels when replacing saturated fats in your diet. Add it with a little vinegar to your salad in place of creamy salad dressings. •	Avocado Oil – For the same reason avocados are a great addition to your salad, so is its oil. If olive oil isn’t your thing, why not try a little avocado oil instead? •	Added sugars – Sugar increases blood pressure and can lead to weight gain, if not kept in check. This in turn can lead to heart disease. Watch out for hidden sugars being added to your salad. Most often, this comes in the form of high fructose corn syrup hidden in salad dressing. But it can even come in the form of dried fruits. While fresh fruit can pack a heart-healthy punch, most dried fruits are a different story. •	Added salt – Diets high in sodium have been linked to high blood pressure—a major risk factor for heart disease. Skip the salt shaker, or any foods that have been processed with more sodium. •	Processed toppings – Processed foods likely have both of the first two worst additions. Add on top a list of ingredients you can’t pronounce, and you’ve got yourself a disaster waiting to happen. Skip the crunchy noodles, fried onions, croutons, bacon bits, and anything else that’s been highly processed. They add little to no health benefits, but pack on the calories and junk. •	Bacon – Unfortunately, bacon is high in fat and calories. Not to mention, on the World Health Organization’s hit list for carcinogenic substances. While it can be consumed in lower doses (and through better bacon manufacturers), it should be avoided if you’re trying to look out for your heart and health. •	Cheese – It’s a bummer, we know. But cheese is mostly fat and high in calories. If you’re trying to eat heart-consciously, avoid the cheese and load up on healthier options. •	Fat free or creamy salad dressings – While adding these to your salad won’t negate the healthful properties of the veggies, they do bring about their own set of issues. Particularly if you eat salads regularly with them. Fat free dressings are generally high in sugar and loaded with other chemicals. Creamy dressings add more calories than they’re worth and can also be laden with high sugar and sodium content. Eating right to protect your heart doesn’t have to mean bland foods with little to look forward to. Adding the right ingredients, whether to your salad, your breakfast, or your main meal can make all the difference. It really comes down to adding knowledge to your arsenal and making better choices. Incorporating most of the foods on the “best” list into your daily diet is a great way to start.